There is a limit to the power you can practically generate with DC electrical systems, so for super yachts and other larger heavier crafts DC thrusters are rarely an option. The greater thrust and extended run time make hydraulic thrusters the ideal choice for commercial crafts and other less manoeuvrable yachts. In conjunction with a good hydraulic system these thrusters offer continuous operation and you can get variable speed control with proportional control and valves. Our hydraulic thruster range from 100 to 550kg of thrust for use as either bow or stern thrusters. For more information about these hydraulic thrusters, please click one of the images below. Choose a hydraulic thruster if you need it for more than close quarter manoeuvring. Hydraulic thrusters offer two advantages compared to electric thrusters. In conjunction with a good hydraulic system these thrusters offer continuous use. This is often necessary for boats such as fishing trawlers, small ferries and some larger yachts where thrusters are used for more than close quarter manoeuvres. The other advantage of hydraulic thrusters is the ability to control speed by means of a proportional control valve. 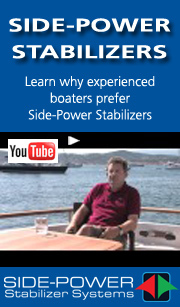 With models from 100 kg to 550 kg of thrust for use as either bow or stern thrusters, Sidepower probably has a model for your boat.